*****EDITABLE*****Expressions and Equations: Simplifying expressions, distributing expressions, one-step equations, two-step equations. Student rubric that outlines all the requirements for creating a board/review game based on this topic. *****EDITABLE*****Graphing and solving inequalities. Student rubric that outlines all the requirements for creating a board/review game based on this topic. *****EDITABLE*****Adding and subtracting integers and rational numbers. Student rubric that outlines all the requirements for creating a board/review game based on this topic. *****EDITABLE*****Multiplying and dividing integers and rational numbers. Student rubric that outlines all the requirements for creating a board/review game based on this topic. *****EDITABLE*****Ratios, rates, proportions, and percents. Student rubric that outlines all the requirements for creating a board/review game based on this topic. 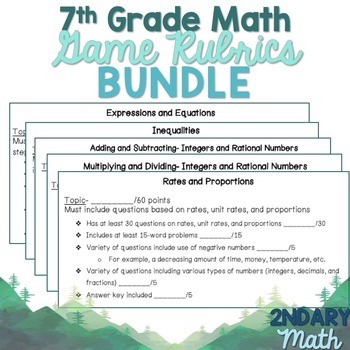 This purchase is based around students creating their own games revolving around a 7th Grade Mathematics Standard.